(Vatican News) Young people from around the world are getting ready to join the Catholic Church’s World Youth Day (WYD) in less than a fortnight in Panama city, including a contingent from the Philippines. At least 70 young Filipinos, including some priests and bishops, are set to attend the event that takes center stage in the capital of the Central American country from Jan. 22 to 27. However, many more are expected to register before the big event begins. “I am the servant of the Lord. May it be done to me according to your word,” is the theme of the world event which the Pope is scheduled to join on January 23. Father Conegundo Garganta, executive secretary of the Episcopal Commission on Youth of the Catholic Bishops’ Conference of the Philippines (CBCP) said at least 70 youth pilgrims have registered for the event. “There are still other groups that have yet to send the names of their delegates,” he said. He estimated that there would be at least 250 Filipino delegates attending the international gathering. This year, the WYD coincides with the Year of the Youth in the Philippines. The special year was declared by the country’s bishops’ conference as part of preparations to mark the 500th anniversary of the arrival of Christianity in the Philippines in 1521. The Philippines was the first Asian country to host the WYD from January 10–15, 1995 in Manila. St Pope John Paul who established the WYD in 1985, joined the event exactly 24 years ago on Jan. 12. 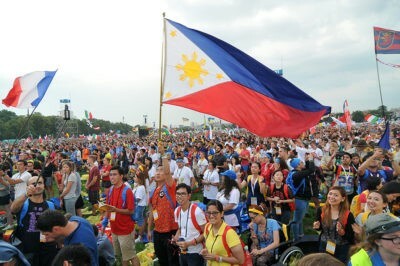 The concluding papal Mass at Luneta Park was estimated to have drawn more than 5 million people, a record for WYD. The presence of the Pope has been a special feature of World Youth Days. During his WYD in Panama, Pope Francis will meet with young people not able to attend the festivities such as those in jail and some living with HIV. He also will dedicate the altar of Panama’s newly renovated 400-year-old cathedral, meet with bishops from Central America and have lunch with some of the young participants. During his 26th trip outside Italy, the Pope is scheduled to deliver 7 speeches, celebrate 2 Masses and lead a penitential service. Next PostARCHBISHOP DOM HENRYK HOSER APOSTOLIC VISITOR ON EXPANSION OF MEDJUGORJE SANCTUARY – We are building a new Medjugorje!